Despite of the advancements in information and telecommunication technologies, slow and intermittent Internet connection is still a serious issue in many places of the World. We all know that Internet became one of the very important parts of our everyday lives. We believe that providing access to information on the Web is crucial and OwNet is application, which helps to make the Internet more accessible. 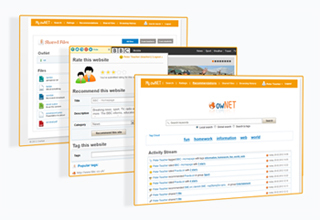 collaborative tools such as web pages ratings and recommendations by and for a community or a group (e.g., a same class). Application OwNet is mainly focused to help to students and schools with low quality Internet connection. This problem(slow and intermittent Internet connection) can be found almost in every world country, but it occurs espeacialy in developing ones. We believe that providing access to information on the	Web is crucial for young people in this countries to get the required skills and acquire experience in order to finally achieve significant progress in solving problems of their countries. But OwNet is not restricted just to over mentioned area of usage. This application can be helpfull also in situations, when there is temporary absence of Internet connection (e.g. travelling by train, during flights, travelling to remote locations...). Particularly OwNet's abillities of inteligent caching and prefetching is usefull in these situations.